It seems that the stars are conspiring to help me. 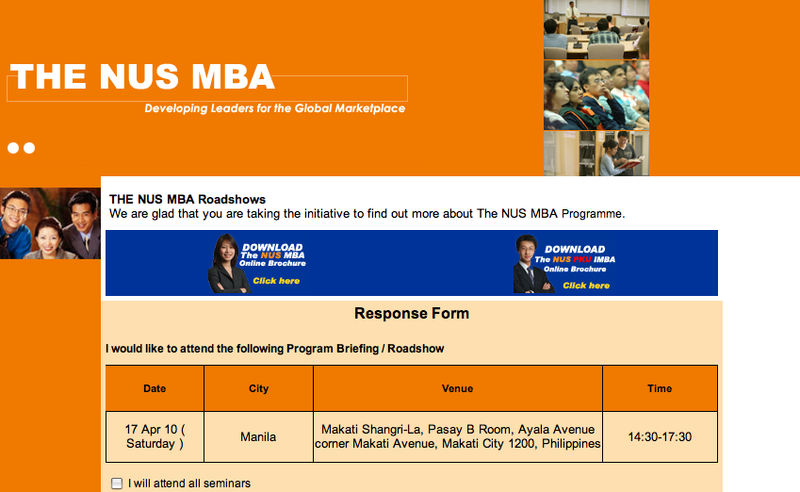 Because coming to Manila this April 17, Saturday, is the NUS (National University of Singapore) MBA Roadshow. And, being the good, focused, and determined girl (or should I say woman) that I am, I have already registered. I really want to get my MA / MBA in an Ivy League university in North America but its horrendously expensive given our Third World cost of living. 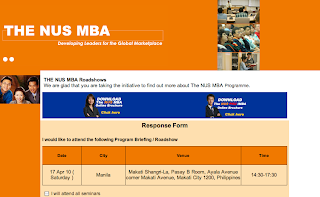 So, I would gladly settle for an MA / MBA in a Singaporean university since their programs are at par with those in North America and Europe. It's not horrendously expensive (just expensive!). And, definitely workable. Especially, since I also plan to work in Singapore some time in the future. I'll find out exactly how workable it is on Saturday. Tomorrow just keeps getting better and better! I turned 30 last April 7, 2010. Although I always make lists (things to do, things to buy), I’ve never thought of making THE LIST. You know, the list of things you wish to accomplish in life. Turning 30 has made me realize how I sorely needed THE LIST to get me back on-track. Although I've missed my chance to do these before I hit the big 3-0, it's never too late to make a fresh start. So, I figured, why not do them all before I turn 35? 8) Try all the restos featured in "Manila's Best Kept Restaurant Secrets"
P.S. 36) "Going to Toronto to visit my dearest sister, Giselle!" *Replaced the "Eat My Way to the 14-Day Nestle Fitness Cereal Diet"
...and, the First Step We Shall Make!